Curuba is a relative of common passion fruit. 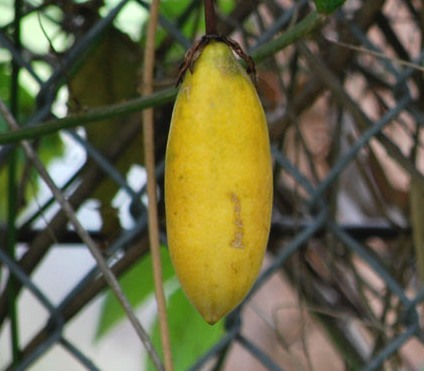 As the fruits are long looking somewhat like banana, so it is also called a banana passion fruit. It is a native of the Andean region of Bolivia, Peru, Colombia and Venezuela. The cultivation of this fruit has become popular during the last two centuries only. Now it is quite commonly grown in the home as well as on a commercial scale in South America especially Colombia. It is regularly sold in local markets. Curuba has now also been introduced to some other parts of the world e.g. Hawaii, New Zealand southern states of India. A vigorous climber 6-7 m long, stem nearly cylindrical, densely coated with yellow tomentum. Leaves 3-lobed, 7.5-10 cm long and 6-12 cm wide, finely toothed, downy above and grayish-or yellowish-velvety beneath; stipules short, slender and curved. Flowers showy and attractive, have a tube 7.5-10 cm long, gray-green, frequently blushed with red, rarely downy; corolla with 5 oblong sepals and deep-pink petals, 5-7.5 cm wide. Fruit is oblong or oblong-ovoid, 5-12 cm long, 3-4 cm wide, rind thick, leathery, whitish-yellow, in some form dark-green, and minutely downy; pulp (arils) very aromatic, salmon-colored, subacid to acid and rich in flavor, surrounding the seeds. 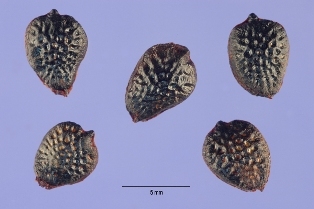 Seeds small, black, flat, elliptic and reticulate. The fruits are edible. But these are more popular for making jams, jellies, ice creams, gelatin desserts and cocktail drinks. Even a wine is also made at some places from curuba. Food value: 100 g edible portion of curuba has been found to contain, moisture 92.0 g, protein 600 mg, carbohydrates 6.3 g, total minerals 700 mg, calcium 4 mg, phosphorus 20 mg, iron 0,4 mg, riboflavin 0.03 mg and niacin 2.5. It is a very good source of vitamin C containing 70 mg of this in 100 g of pulp. Corba juice is rated as the tastiest among all the passionfruits. A popular drink called sorbete de curuba. is made from curuba in Colombia. 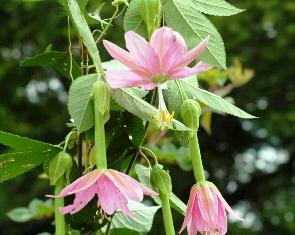 Curuba is also a fine garden plant due to its very attractive flowers. Curuba is more cold hardy than the common passionfruit. It can withstand temperatures upto -5 C. However, it flourishes best in subtropical and warm-temperate regions. 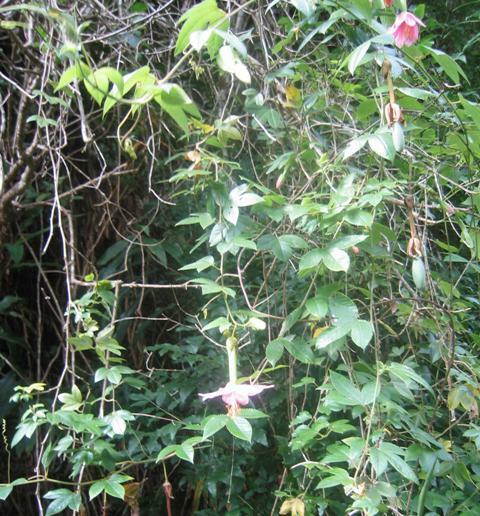 In the tropics the vine generally does best at higher elevations. Curuba is a very prolific bearer. A single vine of curuba can bear upto 300 fruits.